1560 Cast Bronze Body Scupper Drain - Jay R. Smith MFG Co.
90° Threaded Outlet. Used at junction of roof and parapet or in metal lined gutters. Used at junction of roof and parapet or in metal lined gutters. Gasket and metal lining are secured with grate, insuring a watertight arrangement. 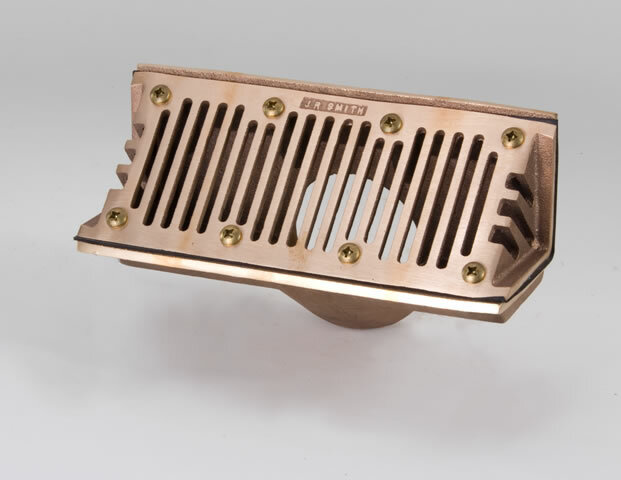 Cast Bronze Body with Combined Rough Bronze Grate and Flashing Clamp and Gasket. Smith No. 1560 cast bronze body, bronze clamping grate and gasket. Smith No. 1570 for 45° outlet. Smith No. 1680 for side outlet.